All was going great in Yankee land on Sunday and early Monday, before the Yankees did something monumental at their Fortress. 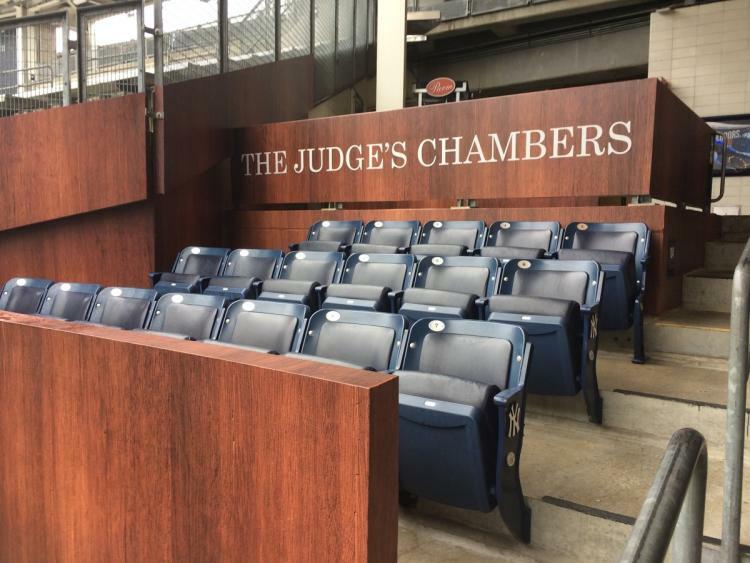 They added a special section called “The Judge’s Chambers” and it marked the first time the Yankees were marketing a player. The Yankees who are famous for being all about the team and not marketing individuality, are evolving with times. Yankees have a strict dress code starting from the hair cut and facial hair all the way down to not having names on the back of their jerseys. From legends like Don Mattingly, to all the way down to a top prospect like Clint Frazier, players are forced to not have long hair when they are dawning the pinstripes. The team has been late to the party many times, when trying to appeal to the young fans. They did something smart to appeal to young fans but it could easily backfire for them. The Judge’s Chambers, are suppose to attract fans that are wearing Aaron Judge jerseys and create a fun atmosphere, are monumental and a little too early. The Yankees are finally marketing their players in a way that will attract young fans to come to Yankee Stadium. They have never done anything like this before, even though greats like Babe Ruth and Reggie Jackson played right field, just like Judge. The section has eighteen seats for lucky fans and it looks like a smart idea on their part to finally market their young players, who are going to be here for a long time. I do not like this idea simply because it is too early. Judge has only been at the big club for two months and there have been signs that show, that his historic pace can and will slow down at some point. He has recently struggled, which creates the possibilities of him not living up to his high expectations. Though I am a big fan of Aaron Judge and I have him on my fantasy team this whole season, but what if someone else is the real deal. Judge is the first of many prospects that has made it to the big club, many like Gary Sanchez, Clint Frazier, and Gleyber Torres are going to go on great runs also. What are the Yankees going to do when the other prospects are better than Judge, that is my only real issue with the new addition. The new section and such marketing will create much higher expectations for Judge, but I do think he is able to handle the higher exposure.